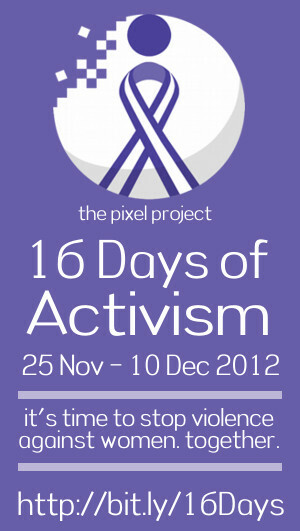 25 November 2012: The Pixel Project is proud to present their second annual 16 For 16 campaign. This holiday season campaign is The Pixel Project’s contribution to the international 16 Days of Activism Against Gender Violence campaign. This year’s 16 For 16 campaign has two components: The first is a blogging marathon to raise awareness and inspire action to prevent and stop Violence Against Women (VAW); The second is a digital music EP featuring songs from artistes from around the world saying NO to violence against VAW while raising funds for The Pixel Project.